The following software systems (Freeform Origami, Origamizer, Rigid Origami Simulator) are proprietary software provided under the following license. The user is allowed to use the software if and only if both of the following conditions are satisfied. Before using the softwere, please contact me in advance. (Non-Commercial Use) The use of the software is non-commercial. (Attribution): The resulting works achieved using the software, e.g., research publications, exhibitions, educational workshops, etc. acknowledge the usage of the software and cite at least one of the following references. Tomohiro Tachi, "Generalization of Rigid-Foldable Quadrilateral-Mesh Origami," Journal of the International Association for Shell and Spatial Structures (IASS), 50(3), pp. 173--179, December 2009. Tomohiro Tachi, "Freeform Variations of Origami", in Proceedings of The 14th International Conference on Geometry and Graphics (ICGG 2010), Kyoto, Japan, pp. 273--274, August 5-9, 2010. Tomohiro Tachi, "Freeform Rigid-Foldable Structure using Bidirectionally Flat-Foldable Planar Quadrilateral Mesh", Advances in Architectural Geometry 2010, pp. 87--102, September 2010. Tomohiro Tachi: "Origamizing Polyhedral Surfaces," IEEE Transactions on Visualization and Computer Graphics, 16(2), pp. 298-311, 2010. Tomohiro Tachi: "3D Origami Design based on Tucking Molecule," in Origami4, pp. 259-272, 2009. Tomohiro Tachi: "Simulation of Rigid Origami ," in Origami4, pp. 175-187, 2009. For questions and discussions, please use this place http://www.curvedfolding.com/group/freeformorigami. Bug fix on obj import. Rendering in SVG is supported. Added "Origamize" option to convert a polyhedral mesh to a resch type tessellation. Added global developability and flat-foldability for a mesh with hole (it may be still buggy). Fixed bugs in the crease pattern editing. fixed bugs in the Add Ref Pts. Added Tool->EqLen and Tool->EqAngle to add equal foldangle or lengths constraints to an edgegroup. additional functionalities and bug fixes. reads mountain and valley of exported obj files (written in comment lines). individual reference points can be added from a model menu. Developability & Flat-foldability support for mesh with holes. Support for Color by Layer. Enabled drag and drop of file. OBJ files automatically reassigns MVs. This is a 3D origami design software. 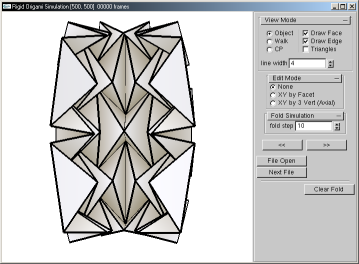 The software generates a crease pattern that folds into a given polyhedron. 2008/08/29 ver 0.47 Release fixed problems in reading obj file generated by wings3D. Simulates kinematics of rigid origami from *.opx or *.dxf crease pattern. 2010/09/19 ver 0.09 fixed scaling bug. 2010/08/30 ver 0.08 fixed several bugs. 2009/05/24 ver 0.07 improved the accuracy. 2008/08/28 ver 0.06 support for half folded final state specified by layer name. 2008/07/05 ver 0.04 fixed problems with importing dxf. support for unnested blocks. 2007/09/29 fixed some bugs in file input / support for 0 vertex model.